Royal Caribbean is a popular cruise line that excels at making each cruise one to remember. There are currently 26 ships in the fleet, which travel to around 260 destinations worldwide, including the Caribbean, Alaska, Australia and newly-renovated private island, CocoCay. Located in the Bahamas, where you’ll find the tallest waterslide in North America. 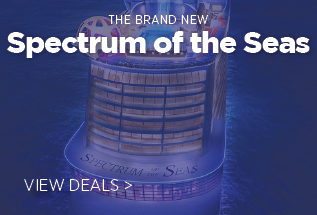 Their newest ship, Spectrum of the Seas, the first of the Quantum Ultra Class cruise ships. Spectrum of the Seas is currenly sailing around Asia. Joining the fleet in Autumn 2020 will be Odyssey of the Seas. The list of facilities aboard each ship is nothing short of impressive. For thrill-seekers, there is the FlowRider surf simulator, plus waterparks, rock-climbing walls, ice-skating rinks, a skydiving simulator and the North Star, pods that soar 300 feet above sea level. Entertainment-wise, take your pick from ice skating shows, West-End productions, AquaTheatre outdoor acrobatic shows and plenty of bars, including the Bionic Bar where cocktails are served by robotic bartenders. After all that, treat yourself to some pampering treatments in the spa or take a stroll through Central Park, an avenue lined with boutiques and restaurants. 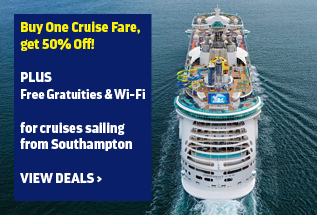 Buy one Cruise Fare, Get one 50% off! *terms and conditions apply. 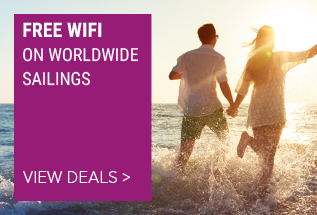 Offers only applicable on certain cruises/cabin categories. Royal Caribbean's fleet of cruise ships boasts an amazing variety of thrilling activities, spectacular entertainment, mouth-watering dining, not to mention award-winning kids’ and teens’ clubs, spacious, comfortable accommodation and sailings that take in some of the most incredible destinations in the world. 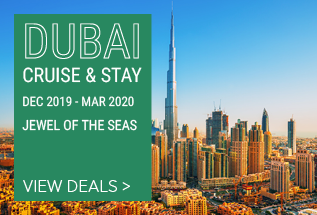 So whether you’re looking for a fun-packed family adventure, a relaxing couple’s retreat or anything in-between, it’s waiting for you onboard one of the exceptional cruise ships. With so many extraordinary activities on offer, you can tailor-make your Royal Caribbean holiday to be just as exhilarating (or relaxing) as you like. Head for the heights with the rock-wall, catch waves on the FlowRider, or make a splash in the H2O Zone water park. Or, if rest and relaxation is more your thing, retreat to the blissful Spa to pamper yourself from head to toe. With most of the activities free, you’ll always find fun for all the family onboard. *onboard activities vary between ship.